The Model HP-1 is a simple, low pressure, reliable, & light weight power supply, that delivers plenty of fluid power to operate BMF torque wrenches up to 10,000 Ft-LBS. Operation is very simple! Just turn the unit on and dial in the desired torque. The man handling the wrench then controls its operation by a valve on the wrench. A Separate electrical control pendant line is NOT used. If faster make-up is desired, choose the Model HP-1V to double the wrench speed over the Model HP-1 power supply. * Air powered model. 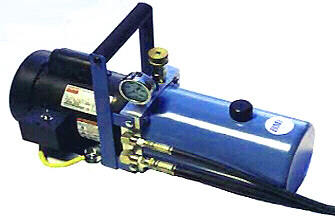 Includes air filter, regulator and lubricator.